Reporting of this week’s University of Texas/Texas Tribune Poll can’t help but present a simple story: Wendy Davis is down, Greg Abbott is up. The partisan responses to the poll results have been similarly predictable. The Republican chorus is singing I-told-you-so, chalking up Davis’ position to the impact of the media pack reporting of her biographical fudges. The Democratic peanut gallery has pointed to the fact that the poll was in the field before Ted Nugent did a double live gonzo on Abbott’s thus far business-as-usual campaign. The partisan responses are simultaneously more or less plausible, but in both cases frequently overstated – not a shocking state of affairs since we are, after all, in the middle of an election year. But these latest results reflect factors that are much more deeply rooted than the low-hanging fruit making headlines and feeding campaign emails: Abbot’s 11-point pre-Nugent advantage emerged from the relatively static underlying pattern of partisan identification in the state and the dynamics of candidate name recognition ­– both of which still add up to a significant disadvantage for Democrats. None of which is to say that Davis’ campaign has collapsed, as some critics, both friendly and hostile, have suggested. These new numbers are less a sign of the decay of the Davis candidacy than a reversion toward the mean ­– that is, a return to the expected steady state. Davis’ 6-point deficit in the October 2013 UT/TT poll reflected the final dance of her very public coming-out party as the excitement that propelled her into the race in the first place receded into the realities of day-to-day campaigning. At the time, Davis was in a unique position for a Texas Democrat, known by a greater share of the electorate than her Republican counterpart. Davis now finds herself trailing by 11 points, but this current state reflects the underlying partisan composition of the electorate – not some major, event-driven shift in sentiment. These partisan dynamics should be familiar: In the February 2010 UT/TT Poll, Gov. Rick Perry led Bill White by 9 points and eventually went on to win by 13. As the campaign begins in earnest, it’s not that Davis is captaining a sinking ship – it’s that she’s setting sail from a port familiar to the Democrats that have come before her. While the importance of partisan dynamics can’t be understated, and thus might bolster the Davis campaign’s resolve — at least they’re doing no worse than any other recent Democratic candidates — it’s also the case that these results reveal a lost opportunity for the Davis campaign. We wrote in September of last year that Abbott’s greatest weakness was his relatively low name identification among the Texas electorate. This presented Davis with an opportunity to define Abbott to a large swath of the electorate in whatever manner would most benefit her campaign (e.g., Abbott as the defender of education cuts, Abbott as a fighter in the War on Women, Abbott as out of touch with the mainstream, etc.). Instead, it appears as though Davis spent much of her time since October fundraising – certainly a necessity in a state as large as Texas – but even then, her absence was much noted as potentially beneficial campaign issues came and went. In this context, Robert Draper’s recent peek inside the Davis campaign provides some possible insight into what might have been happening beyond fundraising. It also illustrates the costly lack of Democratic Party organization or effective allies capable of providing some scaffolding to a first-time campaign. The absence of efforts by Davis or other effective surrogates to define Abbott early and often gave Abbott the time and space he needed to define himself to the Texas electorate, and polling results show that he’s been very successful in this pursuit. In October, 36 percent of Texans had a favorable opinion of Abbott, 24 percent an unfavorable opinion, with the remaining Texans unable to express an opinion about the attorney general. (Numbers don't total 100 percent because of rounding.) In our February poll, only 31 percent were unable to express an opinion of Abbott, down 10 points from October, and 45 percent expressed a favorable opinion, a 9-point increase over the same period. Davis’ absence left a vacuum for Abbott to fill, and he surely did, burnishing his name ID in an almost uniformly positive manner. On the other side of the ledger, attitudes toward Davis went basically unmoved, except for the roughly 4 percent of Texans who moved from having no opinion to having a negative one. The last few months thus represent a lost opportunity for the Davis campaign and a major win for Abbott. While Davis needs to both mobilize large groups of Democratic voters in an off-year election and persuade no small number of Republicans to defect, the task is becoming harder by the day. Among key groups that Davis might hope to court, Abbott looks stronger – at least so far. 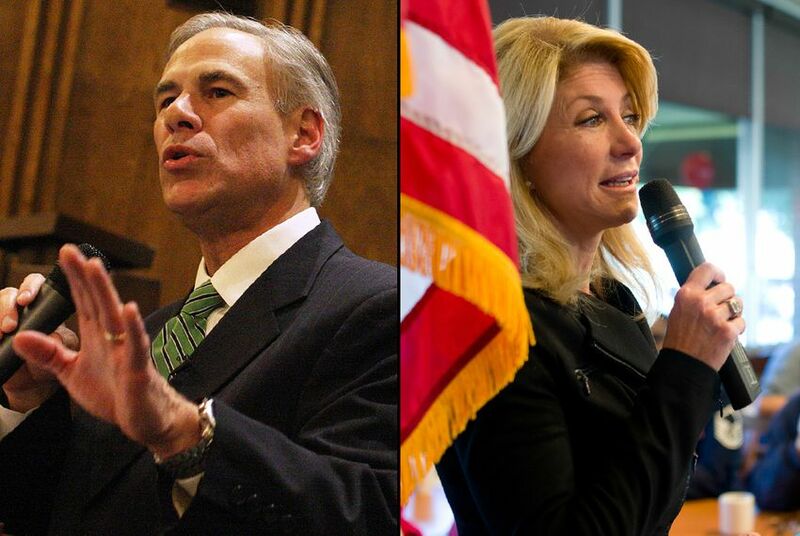 On the trial ballot, Abbott leads Davis 42 percent to 40 percent among suburban women; among Hispanics, favorable attitudes toward Abbott have increased from 21 percent in June 2013 to 30 percent in October to 39 percent in our most recent poll. Add to this that most of the Texas electorate, especially in non-presidential years, tends to be white — where Abbott leads Davis 57 percent to 32 percent — and Davis’ challenge only grows. Abbott, on the other hand, should be looking to run a business-as-usual campaign, focused almost exclusively on simply feeding his base of Republican voters, however restive they appear in some of the sharply contested primaries. Until recently, there was little reason to expect that he’ll have to do anything other than run as the presumptive winner. The sudden prominence of Nugent’s history of race-baiting, misogyny and generally predictable C-level rock star misbehavior has roiled the surface of Abbott’s smooth sail, and hints at the kind of unpredictable jolt, particularly along the gender fault line, that the Davis campaign would need to shake up a seemingly over-determined campaign. But the undercurrents of this campaign flow powerfully. Even the thrashing of Nugent is likely to get swept away unless a larger storm hits. *Editor's note: An earlier version of this post incorrectly said that in an October poll, 28 percent were unable to express an opinion about Attorney General Greg Abbott.